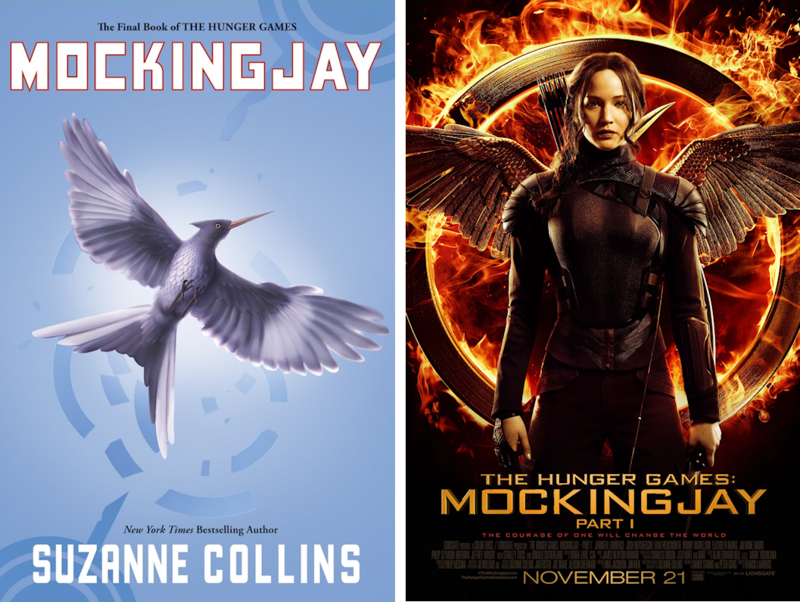 Mockingjay was my least favorite book out of the entire series, which was partly because of the lack of arena. One of its strengths, however, was that it allowed more focus on other themes such as the sorrow and desperation characters felt and the way the districts rebelled against the Capitol. All in all, the movie managed to capture these things almost perfectly while also sticking mainly to the original plot. The movie picked up right about where Catching Fire left off, with Katniss saved from the arena and residing in District 13. From that point, the movie followed the book almost effortlessly while still taking some artistic freedom here and there. The viewers follow Katniss as she battles with all of her emotions regarding her killing of her fellow victors, Peeta’s imprisonment in the Capitol and the bombing of her hometown. She then decides to become the symbol of the rebellion though and lots of action takes place. Not only do we get to see her participation in the cause, we get to see how the Districts rebel exactly and at some point the perspective even shifts momentarily towards President Snow. The portrayal of the war often gave me chills because it was so spot on. It actually reminded me a lot of the war footage that seems to dominate the news nowadays, that’s how real it felt. Despite the fact that I did not agree at all with the decision to split Mockingjay into two movies, I actually liked the ending. The last 15 minutes or so were absolutely nerve-wracking because I knew what would come and yet I was afraid at which scene Part 1 would end. I think the book was split nicely though with enough drama towards the end to make the viewers (me included) excited to watch Part 2. It will be such a long wait! Naturally, there were some differences between book and movie, a few of which I did not really like. Katniss’ prep team consisting of Venia, Octavia and Flavius unfortunately made no appearance. In my opinion their small part in the book was actually really crucial. Katniss finds them locked up and mishandled in some kind of prison in District 13 and it’s perhaps the first time she really realizes that – while the Capitol mistreats people – Coin isn’t exactly an angel either. And though they replaced her prep team by Effie in the movie (whom I love! ), that particular scene was left out and I thought it was a shame. I was also a bit disappointed by Sam Claflin’s lack of screen time and the fact that some of Finnick’s greatest lines were given to other characters. It might just be because he’s one of my favorite characters that I wanted to see him on-screen so badly, but I felt as though he played a much more important role in the book. Lastly, when Katniss made her list of demands in the movie, the crucial “I kill Snow” clause was not present. I’m not really sure about this choice from the director because it is a really important aspect of the plot, especially in regard to second half of the book. The cast provided a brilliant performance though, as always, and many of the new characters looked just like I imagined them in the book. In addition, I was also completely mesmerized by the music, especially because it resembled scores from the earlier movies. One of the most powerful moments in the movie also happened to be when The Hanging Tree song was revealed. I definitely got goosebumps at that point! If you’re still wondering if you should go see this movie or if it’s as good as the book: the answer is yes. I loved it and the only reason I’m not giving it five stars is because of some of the changes I mentioned above.